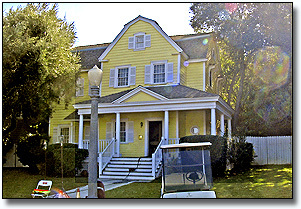 Universal is unique among the various Hollywood studio tours because their tour is only one part of a much larger theme park experience. I’ll review Universal Studios Hollywood in general on another page. (To read it, click here.) This article will deal solely with the studio tour. In studio lingo, the "front lot" is where you’ll find sound stages and offices, while the "back lot" is where you’ll find the large outdoor sets that the public tends to think of when they hear the words "movie studio". These big back lots are an endangered species in these days of on-location filming. Universal Studios and Warner Bros. are the only two studios which still have large "back lots" filled with colorful sets. As such, their tours tend to be more interesting than those at the other studios (e.g. Sony & Paramount, where what visitors mostly see are the exteriors of sound stages). And because of the large size of their back lots, both Warner Bros. and Universal use trams in their tour (while Sony and Paramount offer walking-only tours.) The good side of this is that is the trams save visitors a good deal of walking. The drawback is that a tram-based tour can seem more removed from the reality of movie-making, and less personal than a walking tour. On the other hand, Universal spiced up their tour with something that Warner Bros. doesn’t try to offer: special effects and unique "rides" within the tram ride. Not very authentic, perhaps, but still entertaining. 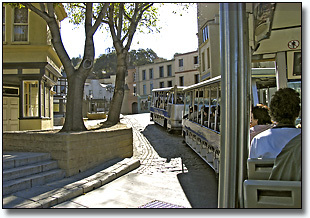 Like Universal Studios Hollywood itself, the tram tour is part authentic studio tour and part show-biz razzle dazzle. How you will react to this depends upon what you’re looking for. If you want your studio tour spiced up with jumping mechanical sharks and simulated earthquakes, Universal is the place to be. If you’re looking for authenticity and Hollywood history, Warner Bros. is the best bet. But enough with comparisons... Let’s get to the tour itself. The layout of Universal Studios Hollywood is such that most of the theme park is located on top of the hill (near the main gate), while the working studio (the front and back lots) are located far below. To reach the tram boarding station, guests ride escalators down about half way down the hill, and the tram ride takes them the rest of the way down to the working lots. Between the roar of the tram engines and the flashy special effects along the way, it’s easy to miss the commentary by the tram tour guide/narrator. But you’ll do yourself a favor to pay attention to his spiel. Universal has a proud history of movie-making. "More movies and TV shows have been shot at Universal than at any other studio," our guide tells you at the start. And as you make your way through the various sets, the guide will inform you of many of the movies and TV shows that were shot on those exact sets (as well as those being currently shot there). The tour begins with a quick trip through the front lot, past the offices of creative types (like Steven Spielberg) and the many massive sound stages: those warehouse-sized buildings with the numbers painted on them. (Sound stages are basically empty space where movie-makers can create whatever environments they need inside - while enjoying the controlled lighting, sound, and protection from the weather that only an inside location can afford). Your tour guide will tell you that the very first sound stage at Universal was Stage 28, built back in 1925 for the original Lon Chaney version of "Phantom of the Opera". 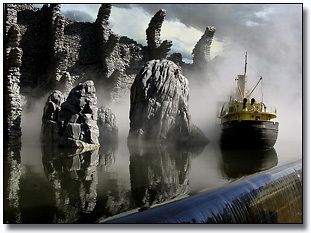 The same Stage 28 was used for productions such as "Psycho," "Bride of Frankenstein" and even "Jurassic Park". On my last visit, they were shooting "CSI" nearby on Stage 24 and "Crossing Jordan" on Stage 41. We then move on to the back lot and its large, permanent sets. We see a New York Street, a series of brownstones, a "Small Town", "Old Mexico", "Six Points Texas" (their Western streets), "Little Europe" and the "Square of Warriors". For the most part, these streets are "facades", fake exteriors made of foam rubber and fiberglass - but they sure look real. And they are designed so that they can be made to look like different areas by simply changing a few signs or props. For instance, "Little Europe", began life in the 1920’s (helping Universal win its first Oscar for "All Quiet on the Western Front"), and went on to star in countless class horror films ("Frankenstein", "Dracula", "The Wolf Man"...). But it is flexible enough that it is also seen as a street in Paris in "The Pink Panther" (with Steve Martin), a street in Germany in "The Good German" (with George Clooney), and various ports o’call in the three "Pirates of the Caribbean" films (with Johnny Depp). The "New York Street" was seen in such movies as "The Shaggy Dog" (with Tim Allen), "Spider-Man 2" (in the scene where the car comes crashing into the cafe), as well as TV series such as "Alias", "Boston Legal", "The A-Team". The Old West town (where six different Westerns could be shot at the same time on its six streets) was also the location of a "Star Trek: Enterprise" episode and of scenes from the series "Carnavale". "The Square of Warriors" was built to look like Rome in the movie "Spartacus", but it also was seen as the city of Gomorrah in "The Scorpion King" (starring "The Rock"), and in "The Princess Diaries 2", where it played the role of Anne Hathaway’s fictional European kingdom. Normally, you’d recognize "Courthouse Square" from the "Back to the Future" films, with its classic clock tower (that was struck by lightning in the movies). But on my last visit the Courthouse was virtually unrecognizable - since its Small Town area is now serving as the set for "The Ghost Whisperer", and they wanted a different look. The tram takes you right past the actual "Bates Motel" and the famous old house from the movie "Psycho", and past the "Chicken Ranch" house from "Best Little Whorehouse in Texas". You see man-made lakes (one of which is "parted" like the Red Sea for the tram to drive through) and "collapsing" bridges. 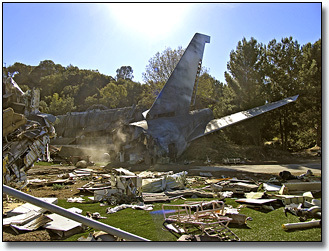 New sets include one wintry twirl of Dr. Seuss fantasy from "The Grinch", and an impressive set from 2005’s "War of the Worlds" (with Tom Cruise), where an airliner has crashed into a residential neighborhood. The actual, full-size 747 jet airliner fuselage is there, ripped in two, it’s tail section still intact, while its engines smolder in the ruins of the tract houses around it. It’s an impressive addition to the tour, and the trams slow down long enough to give the riders a good, long look at the set. As I mentioned, the Universal tour is half history, half special-effects-extravaganza. So what about those f/x "extras"? Look out, because they never miss an opportunity to try to spice up the studio tour with a little "show", often when you least expect it. Sometimes it works reasonably well - such as the "flash flood" in the "Old Mexico" section (which is so obviously fake that it’s actually fun). Other times it falls flat: such as the "Jurassic Park" velociraptors standing motionless at the side of the road when the tram passes through the studio’s "Greens Department" (an outside nursery). But they don’t stop there. Employing the basic idea of a large sound stage, they have built-in several ambitious "rides" within the tour itself. The tram rolls through the open doors of a sound stage building, and guests suddenly find themselves face to face with a roaring "King Kong" (who looks rather fake, compared to his 2006 movie version), or find themselves inside a collapsing subway station during a 7.0 earthquake (which really rocks the tram). There’s an entire "Amity" set - the small town where the movie "Jaws" took place. If you’re sitting in the front car on the right side, prepare to get wet when the shark suddenly pops up out of the water, gnashing its teeth - preceded by a bloody attack on a skin-diver and accompanied by exploding gas tanks. They like both fire and water on this tour -- a lot. Exploding balls of hot flame are featured in the Jaws section, Fast & Furious, King Kong, and Earthquake (not to mention off the tour, in the all-fire "Backdraft" walk-thru and the Waterworld show). A recent addition to the tram tour is "The Fast & Furious". It's a major side show on the tour, similar to King Kong, using 3-D ("Peppers Ghost") effects to simulate the stars of the movie franchise being there in person. Like Kong, the tram pulls into a building, meets the 3-D cast members, and then gets caught up in a chase through the streets of LA, via a film that unfortunately resembles a videogame. And right before you leave, they run the tram through a tunnel where the walls revolve. If you have any tendency towards motion sickness, be sure to close your eyes during this experience - it can be very disorienting. A decade ago, it was a wintry tunnel themed to the movie "Avalanche". Now it’s themed to "The Mummy", and features a new surprise, an "attack" by scarab beetles (simulated by water droplets on your skin). When I heard that Universal was going to add video displays to their trams, I thought it was a great idea. The screens could be used to show clips from the very movies that were shot on the sets guests were driving past, refreshing their memories and enriching the tour experience. Alas, it doesn’t work out quite that well in practice. The current video screens are rather small and somewhat dim out in the sunlight. Add to that the roar of the tram’s engines and the chatter of both the guests and the narrator, and I suspect that most of what goes on up on the video screens ends up getting lost in the shuffle. (One solution would be to replace the current screens with brighter, more vivid video displays.) However, it does allow Ron Howard to bookend the tram ride with nice speeches about the history of Universal. The narration by the tour guides tends to be droll and tongue-in-cheek (think Disney’s "Jungle Cruise"). Half of the charm of this particular tour seems to be that it pokes fun at itself and at Hollywood fakery in general. 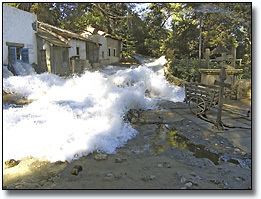 None of the "adventures" one encounters along the way during the tour can be taken seriously (by anyone over the age of five) - and guests seem to enjoy laughing at the fake flash floods (where the trees automatically right themselves after each flood) and the lame "parting of the Red Sea" effect. To avoid long lines to board the tram, take the tour early, when you first get to the park. Most other guests will be rushing off to see the new Harry Potter land or the "Terminator 2: 3-D", or to ride "The Mummy" roller coaster or the new "Transformers" ride. However, if you want a more authentic look at Universal Studios, and are willing to pay a lot more for it, you may be interested in Universal's new VIP Tour, a luxury version of the Universal Studios experience. Starting at $349 per person (compared to the usual $115 for a standard pass), you get a behind-the-scenes guided tour with access to previously "off-limits" areas of the studio. The tours are limited to no more than 15 people at a time (aboard private trolleys and on foot), and includes such extra perks as a continental breakfast at their VIP Lounge and tours of the studio's production areas. VIP guests get to visit sound stage sets from current TV productions such as Crossing Jordan, as well as the studio's huge prop department, the sound department, a house built especially to accommodate cameras for interior shots, etc. The six hour tour gives guests the chance to see how sets are built, how lighting is designed, how sound is added after filming, etc. And back in the theme park area, the VIP tour also gives you escorted front of the line privileges, that lets you go straight to the head of the line for all of the park's rides (such as Jurassic Park and the Mummy roller coaster, and the new Harry Potter and the Forbidden Journey), and gives you reserved seating at all the shows such as Waterworld and Terminator 2: 3-D (including behind-stage meet & greet with the shows' performers). You also get unlimited food service at the park's cafes. They even let you see an Oscar statuette up-close... Looks like they've tried to pull out all the stops. Prices for the VIP tourwill no doubt go up in the future. You can check them here, or call (818) 622-8477 for more information about the VIP tour. It's a nice way to be pampered and see a lot more than the average tourist - if you can afford it. Space is very limited on these tours, so you need to book reservations ahead for this one, since space is limited. You can phone the VIP Tour office at (818) 622-8477, or you can make reservations online, at www.UniversalStudiosHollywood.com. Ticket prices include both the theme park and the studio tram tour. Since 2016, Universal followed Disneyland's lead by introducing a fluctuating price schedule that charges higher prices on crowded days, and lower prices on uncrowded days. So, determining exactly what you might pay to enter the park has become a lot tricker. Generally speaking Universal's ticket prices are just slightly lower than Disneyland's, but in some instances, they are actually higher. However, it's often possible to get discounts for Universal if you buy online. Also, the prices of Universal's annual passes are much lower than Disneyland's, and a good deal (although that may be an admission that there isn't much demand for frequent return visits to their park). Click here for the most current ticket prices at Universal Studios Hollywood. Getting there: From Hollywood, take the Hollywood (101) Freeway north to the Universal Studios Boulevard offramp, and follow the signs up the hill to the parking lot.